The 20th and 21st Centuries are characterised by new types of mass migration and forcible displacements. The rise of the imperialist powers has drawn all parts of the globe into the world market, where competition has created a permanent instability. The previous population movements were not as generalised as in our era. 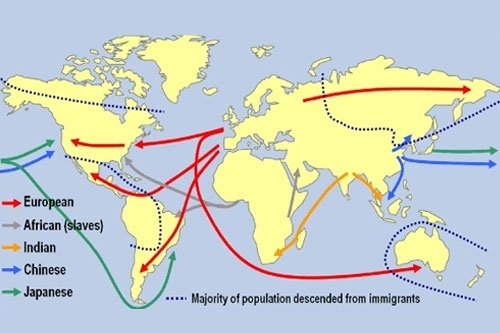 The first major migration of the modern times was the forcible relocation of 11 million Africans to the Americas and Caribbean through the slave trade. As the economy in the Western hemisphere expanded so even this proved insufficient to meet the demand for labourers. The second major migration began leading to over 50 million Europeans migrating to New World destinations between 1820 and 1920. It was not until the 1880s that cumulative European migration to the U.S. exceeded that from Africa. These European migrants were overwhelmingly seeking economic betterment. A minority went to escape religious or political persecution. A much smaller minority were enchained convicts. But the largest majority moved to escape European poverty. The first great surge of emigration occurred as a result of the famines and revolutions of the 1840s. The industrialisation of Europe created a substantial displacement from land work to the industrial towns. The urban population of Germany grew by nine times in the 19th Century, that of Britain by eight times. This move from countryside to town was the first form of migration, and often led to a second form of migration abroad. But as the growth of capitalism drove more people off the land, so direct emigration increased from both rural and urban centres. The remaining less than 25% came from Scandanavia, France, the Low Countries, Russia and Eastern Europe. Most striking here is the size of the Irish emigration. Lower in absolute terms than the British, the Irish emigration is much higher in relative terms. This is the result of the oppressive colonial policy inflicted upon the Irish people by the British government. This oppression reached genocidal proportions in the 19th Century. The great starvation of 1845-8; the many Coercion Acts, and the fierce repression of popular movements all reduced the population by death and migration. The impact of this being that even today the population of Ireland is smaller than it was in 1841. Few colonial wars have had such a lasting impact. The European presence elsewhere in the world was tiny. In 1820 there were less than 100,000 Europeans in Asia, including the Middle East. Equally, in 1820 there were only 35,000 Europeans in Africa, 30,000 of whom were in the Cape. This great wave of migration came to a stop after 1929 with the onset of the Great Depression. The exception to this being the impact of World War II, which saw the forcible removal of large numbers, both during the military conflict and in the immediate post-war years. The next generation of migrants arose from similar pressures to those at work in 19th Century Europe. A huge shortage of labour existed in the imperialist countries as the economies recovered from the war. At the same time the colonies of these powers had undergone a degree of industrialisation creating a movement from the land to the towns. Government policy in the imperialist centres encouraged immigration from the colonies. No-one regarded as unusual the decision of the Minister for Health, Enoch Powell, to organise recruitment campaigns for the NHS in the Caribbean before 1964. This period also saw the rise of the colonial liberation movements, with many countries achieving their national independence. The retreat of the imperial powers created domestic tensions which sometimes resulted in violence towards migrants from those countries, such was the position of Algerians inside France. By the mid 1970’s it was evident that the long economic boom following 1945 was ending. Further domestic tensions arose as restrictions were introduced on migration from former colonies. The migrants, now settled communities, were not credited with the contribution they had made to economic growth. The collapse of the non-capitalist economies in Eastern Europe and the USSR made the US and European powers more confident in their hegemonic position. Hence the assumption that there would be little obstacle to the exercise of military power, and that domestic concerns to maintain the welfare state could be set aside. In this period NATO engaged in the first Gulf War and the war upon Yugoslavia. It should be registered that throughout its existence NATO did not engage in direct military action whilst the Warsaw Pact was in existence. Since 1990, NATO has been consistently involved in such action over an ever widening geographic area. The launching of the ‘War on Terror’ in 2001 has heralded a new wave of military assaults and population displacement. The most recent report, published this month, from the UN High Commissioner for Refugees show that there are 59.5 million individuals ‘forcibly displaced’ in the world at the end of 2014. This is 8.3 million higher than at the end of 2013, and the highest annual increase since records commenced in 1989. The total breaks down into 38.2 million internally displaced persons, 19.5 million refugees (i.e. across national borders), and 1.8 million asylum seekers. When we examine these figures by country the impact of imperialist wars becomes obvious. Over the past three decades, Afghanistan has produced the largest share of refugees. There were 6 million Afghan refugees in 1990-1, mostly in Pakistan and Iran. This was a direct result of the imperialist powers arming and equipping the opposition to the Soviet backed government. Today, after 14 years of direct intervention by NATO, there are 2.59 million Afghan refugees. Syria had the highest number of refugees at the end of 2014, 3.88 million. Prior to the Western support and arming of the rebellion in Syria in 2012, Syria was not in the top 30 source countries for refugees. After these countries, Somalia and the Lebanon both register 1.1 million refugees. Both countries have endured many years of direct and covert military action from imperialism. The wars underway in Libya and Yemen have not yet produced large numbers of refugees, but at the end of 2014, Libya had 363,067 internally displaced persons, and Yemen 334,093. The NATO intervention in the Ukraine is clearly having a much more significant impact than our media suggests. There were 237,636 refugees at the end of 2014, and 823,000 internally displaced persons. Equally significant is that the Russian Federation became the most popular destination for asylum seekers – with 271,000 applications being lodged by Ukrainians. This becomes incomprehensible if the Western narrative of Russian belligerence is accepted. The second war upon Iraq in 2003 created two million refugees, and two million internally displaced persons. 12 years after the intervention began Iraq still has 369,904 refugees, and 3.6 million internally displaced persons. The torment of 2 wars, sanctions, occupation and the promotion of sectarianism by the imperialists have created a social catastrophe for the Iraqi people lasting nearly three decades so far. Some refugees have spent decades in exile. This is most evident for the Palestinians, where 5.1 million currently qualify for UN programmes. Amongst Afghan refugees are some who have been abroad for three decades. The list of most responsive host countries is very revealing, and contradicts the racist narrative current in the UK. The descending order for the top ten receiving countries is Turkey, Pakistan, Lebanon, Iran, Ethiopia, Jordan, Kenya, Chad, Uganda and China. It is notable that these are all poor countries in comparison to the US or UK. With the partial exception of Turkey in Syria, it is also notable that these countries have not been involved in the wars that created the refugees. The developing regions host 86% of the worlds’ refugees. Refugees, despite the UKIP inspired vision, are not flooding to the UK. In fact the least developed countries in the world host 25% of the global total. In this, as in much else, the poor are more generous than the rich. All of these countries have been the subject of imperialist intrigue and intervention. In the cases of Colombia, the Democratic Republic of the Congo and Iraq there have been major interventions for decades. The more recent interventions in Syria, Sudan and South Sudan have still been hugely disruptive. In conclusion, the anti-war movement can contribute to challenging the racist ideas underlying much of the current political discussion on migration and war. This is not simply to point out that the 219,000 refugees crossing the Mediterreanean in 2014 was three times higher than 2011 due to our military intervention in the Middle East and Northern Africa. We also need to uncover our own history as a country that produced one of the greatest emigrations the world has yet witnessed. We need to argue that our country should take a more responsible attitude to refugees, in line with the poorer countries. We need to challenge the use of language which calls an English migrant to Spain an ‘ex-pat’, and a Polish migrant a ‘benefit tourist’. The facts speak against the racists – we must ensure they are articulated. (This article is based on a speech made to the ‘Migration and war’ workshop at the Stop The War Coalition ‘Confronting a World at War’ conference with the UNCHR figures updated here). This article originally appeared here at the Stop the War Coalition.